In the days following the Terror, people calmed down little by little and life resumed its normality. Madame Rendu, concerned about the education of her eldest daughter, sent her to the Ursuline Sisters in Gex. Jeanne Marie stayed two years in this boarding school. During her walks in town, she discovered the hospital where the Daughters of Charity cared for the sick. She had only one desire, to go and join them. Her mother gave her consent that Jeanne Marie, in spite of her young age, might spend some time at this hospital. God’s call, which she had sensed for many years, made itself clear: she would become a Daughter of Charity. 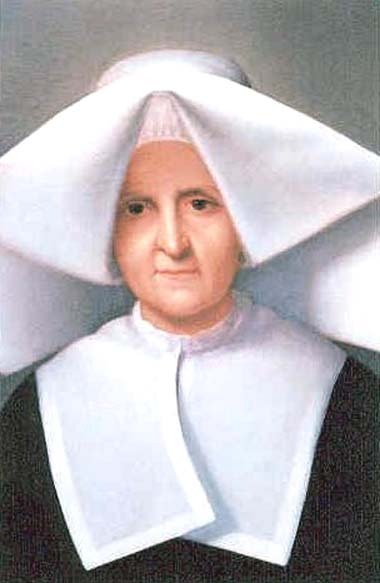 In 1802, Armande Jacquinot, from the village of Lancrans, confided to her friend that she was preparing to leave for Paris to enter the Company of the Daughters of Charity of St. Vincent de Paul. Jeanne Marie leaped at the opportunity and begged her mother to allow her to leave. Having consulted with Fr. de Varicourt, the senior priest at Gex, Madame Rendu, happy, but very emotional at her daughter’s vocation, consented to her request. In 1815 Sr. Rosalie became Superior of the Community at rue des Francs Bourgeois. Two years later the Community would move to rue de l’Epée de Bois for reasons of space and convenience. All her qualities of devotedness, natural authority, humility, compassion and her organizational abilities would be revealed. “Her poor,” as she would call them, became more and more numerous during this troubled time. The ravages of a triumphant economic liberalism accentuated the destitution of those most rejected. She sent her Sisters into all the hidden recesses of St. Médard Parish in order to bring supplies, clothing, care and a comforting word. She was attentive to assuring that her companions had time for prayer, but sometimes there was a need to “leave God for God” as Vincent de Paul taught his Daughters. Once, while accompanying a Sister on a charitable visit, she said to her: “Sister, let’s begin our meditation!” She suggested the plan, the outline, in a few simple, clear words and entered into prayer. Her reputation quickly grew in all the districts of the capital and also beyond to the towns in the region. Sr. Rosalie knew how to surround herself with many efficient and dedicated collaborators. The donations flowed in quickly as the rich were unable to resist this persuasive woman. Even the former royalty did not forget her in their generosity: The Ladies of Charity helped in the home visits. Bishops, priests, the Ambassador of Spain (Donoso Cortéz), Carlo X, General Cavaignac, and the most distinguished men of state and culture, even the Emperor Napoleon III with his wife, were often seen in her parlor. Students of law, medicine, science, technology, engineering, teacher‑training, and all the other important schools came seeking from Sr. Rosalie information and recommendations. Or, before performing a good work, they asked her at which door they should knock. Among these, Blessed Frederick Ozanam, co‑founder of the “Conferences of St. Vincent de Paul,” and the Venerable Jean Léon Le Prevost, future founder of the Religious of St. Vincent de Paul, knew well the road to her office. They came, with their other friends, to Sr. Rosalie seeking advice for undertaking their projects. She was the center of a charitable movement that characterized Paris and France in the first half of the 19th century. Sr. Rosalie’s experience was priceless for these young people. She directed their apostolate, guided their coming and going in the suburbs, and gave them addresses of families in need, choosing them with care. Hardships were not lacking in the Mouffetard District. Epidemics of cholera followed one after another. Lack of hygiene and poverty fostered its virulence. Most particularly in 1832 and 1846, the dedication shown and risks taken by Sr. Rosalie and her Sisters were beyond imagination. She herself was seen picking up dead bodies in the streets. During the uprisings of July 1830 and February 1848, barricades and bloody battles were the marks of the opposition of the working class stirred up against the powerful. Archbishop Affre, Archbishop of Paris, was killed trying to intervene between the fighting factions. Sr. Rosalie was deeply grieved. She herself climbed the barricades to try and help the wounded fighters irrespective of the side they were fighting on.